Rob Gorski April 5, 2013 April 5, 2013 20 Comments on Why do you have to have #Autism to advocate? Why is it that so many people in the Autism Community feel that you have no right to advocate and raise awareness for Autism if you aren’t Autistic yourself? I’m sorry but this is something I find incredibly frustrating and short sighted. Not to mention counterproductive. I would never presume to be a voice for anyone else but my own family. My number one priority is to advocate for my own kids until they have a voice of their own. When my children are this young, I feel that it’s my responsibility to help educate the world about my kids, while I work to educate my kids about the world. When they are ready to speak for themselves, I’ll stand with them in support. I absolutely agree that the Autistic adult community must be listened to. I don’t know why they aren’t. Perhaps part of the non-autistic advocates mission is to help clear the way and let the Autistic adults speak without being drowned out by all the other noise. 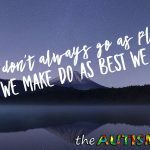 Over the past few years, I have learned to listen to what the adult Autistic community has to say, and very often encourage others to do the same. I’m sure that there are neurotypical people out there that presume to know more about Autism than those actually living with it. Having said that, it’s quite short sighted to assume we are all the same. Not everyone takes that approach. I do what I feel is right, regardless of how unpopular it makes me. The world isn’t a perfect place, especially for those with Autism. Having said that, don’t you think it’s better to have people who care, trying to raise awareness, even if they aren’t autistic themselves? I would think that most people are only trying to help. Maybe we need to coordinate better so no one feels like we are trying to speak for them. Of course, it would be great if people would catch on and learn that the adult Autistic community has a great deal to offer. They are able to provide those of us trying to raise kids on the spectrum, invaluable insight, among countless other things. I honestly don’t know why they aren’t take more seriously. It’s a big problem and one we should be working together to solve. I get amazing advice from the many autistic people I’ve had the honor of making friends with along the way. I have so much respect for them and I hope they know that. One of the reasons I don’t venture far from my own site or Facebook page is because of all the turmoil within the Autism Community. It’s very much like walking through a mine field. No matter what you say or do, someone is going to be offended, angry or upset. There are way to many lines drawn in the sand. We have people who vaccinate their kids on one side and those completely opposed to vaccines on the other. 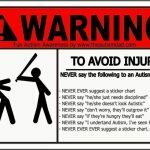 We have those with Autism on one side of the line and parents that advocate on the other. Wouldn’t we be better off as a community, if we could all put aside our differences and work together for the common good? Everyone can play a role and we can play to our strengths. If it were up to me, I would welcome with open arms, anyone that wanted to help. If we want Awareness to be effective, we need to present a united front. Who’s going to take us seriously, when there is so much fighting amongst ourselves? Whether you like it or not, we need adult Autistic’s, parents, sibling, neighbors, family, friends, teachers, therapists, doctors, organizations, businesses, politicians and even perfect strangers to work together to help spread Autism Awareness or Autism Education. The moment we begin picking and choosing who’s aloud to help advocate and raise awareness, we’ve already failed. As far as I’m concerned, my kids are way, way too important to me, to allow our petty differences to get in the way of working together. In my reality, I welcome anyone and I mean anyone that either wants to learn more about Autism or wants to help a special needs family. I’m not picky about who helps in my quest to prepare the world for my kids and my kids for the world. So long as we get results and keep moving forward, together. So well put. People with Autism and the people who love them are such a small group. We need to stand together! I hope it’s OK if I copy-and-paste your apology from the FB thread that this post refers to in here, so folks can see that you had a change of heart and are doing your best to listen to autistic advocates. a better understanding of why what I said was considered dismissive. Please know that was never my intent. I absolutely agree that we need more Autistic’s in positions like this. And I understand why you find what I said offensive. differently, as to convey my point without coming across the way it did. and it’s certainly not what I stand for. have much better understanding of where you are coming from. shannonrosa1 of course it’s okay. Truthfully, I didn’t have a change of heart. I’ve always felt that we need to listen to the Adult Autistic community. I have been advocating for a very long time about why we need to listen the what adult Autistic’s have to say. In fact, listen to my Autism Awareness Message on YouTube and you’ll hear be speak about that. What happened in the Facebook chat was unfortunate. When I posted this apology, it was because I understood why my original statement was deemed as dismissive and that wasn’t what I had intended. I stand by my opinion that everyone has the right to advocate, especially parents. I also stand by my long term feelings that we need to listen to the Adult Autistic community. 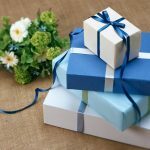 The people that made the list deserve to be there because they have worked very hard to help improve the community and their blogs are the most read. That’s what the list was based on and what they were looking for. I never got a chance to explain where I was coming from because I was basically mobbed for my opinion. Having said that, once again I would like to make my position very, very clear. 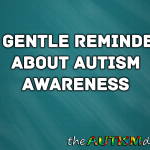 I firmly believe that we need to pay attention to the adult Autistic community because they have invaluable insight and live with Autism every single day. I’m sorry that my opinion is deemed offensive but that’s not how it was intended to be taken. I apologize because I better understand why it was taken as dismissive even though that’s not what I meant by it. I stand by my statement that you don’t have to be Autistic to advocate for Autism. Please let this go. I will have nothing further to say on the issue. shannonrosa1 please understand that I do not approve of or support the tactics of your TPGA. I know you do good work but what happens in that chat should never have happened. I do not involve myself with people who condone the bullying of others that don’t share their same opinion. I apologized because I understood why people were upset, not because what I said was wrong. I want to be very clear that I don’t approve of the way you handled that situation and we are not working together. I will apply what I have learned and use that to further my cause of unity, teamwork and togetherness. I feel that we both want the same thing, but go about it very differently and that’s okay. Your approach just isn’t for me. I support and encourage anyone to advocate for Autism, autistic or not. I have a great many friends that are Autistic and value greatly what they have to say. I give everyone a voice and not just those who see things my way. I wish you the best but I want my readers to know that I do not condone what happened in that chat. If that happened to me, it could happen to anyone and that’s not okay. lostandtired shannonrosa1 Well, of course you don’t have to be autistic to be an advocate. That’s not what the conversation was about — that’s what *you* made it it about. 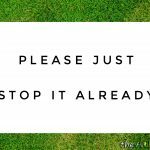 You came into and derailed a productive conversation between autism parents and Autistics about the need to spotlight more autism blogs by PoC and Autistics, and in doing so dismissed autistic voices. You, yourself, kicked the hornet’s nest. Being told that your abelist actions are unacceptable is not bullying. I am deeply disappointed that someone like you — who professes to champion autism advocacy — lacks the humility to listen and learn to Autistics just because they are angry at you. You need to think long and hard about *why* those autistic advocates are angry with you, if you want to make a better world for our autistic children to inherit. shannonrosa1 lostandtiredAs I said. This is a dead issue. You keep calling attention to this chat as though you’re looking to continue the discussion. I’m done with this and have moved on. I would encourage you to do the same. I will continue to do what I do and you will as well. You may not consider what happened bullying but it was certainly not tactful, polite or friendly and accomplished nothing. Please let this die. Comments had to be deleted because of how vulgar your followers were towards me with their personal attacks. If you want to continue focusing on this, please do it elsewhere. Lost and Tired represents people coming together for a common goal. By people, I mean Autistic’s, non-autistics, teachers family, friends and ANYONE else that wants to try and make life better for those in the Autism Community. We respect each others differences and focus on our commonalities. We do not bully nor do we condone it elsewhere. I do not want my position misrepresented by you telling everyone that I had a change of heart. I simply recognized how what I said was taken as dismissive and that was not my intent. I apologized for having upset people but not for my opinion. Autistic or not, those people are still responsible for what they said, as am I. I raise my children to be respectful, compassionate, kind, tolerant and open minded. What happened in your thread on Facebook was anything hut that. I haven’t gone through and read everything but, I know comments were deleted because of how immature, angry, thoughtless and vile they were. This statement is really sad and not something I would be proud of. Everything I said was polite and respectful even if you disagreed with my point. I don’t treat people this way. If the actions of you and your followers are representative of “thinking autism parents” I take that as a compliment. If you feel that strongly about the list, than step down. entirely unsolicited by us — is embarrassing. 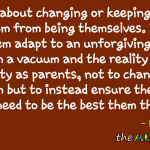 arrogant ableism under faux-humility to other autism parents. You said it perfectly. I don’t think I’ll ever understand why some might view it as an either/or. 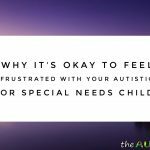 I want to learn from autistic adults and consider their experiences vital, but I also want to learn from parents who’ve walked this path before me, as their experiences are also vital! Just like you I intend to continue advocating/speaking for my small child, as that is what any decent, loving parent would do. How could we not? Anyway, thank you for what you wrote! 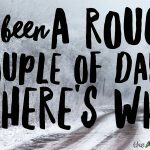 Apparently I don’t venture far enough either…. But yes, moving forward. Together. Kelli Stapleton join the club. It’s crazy out there. How’s everything going on your end.? Yup, as I said… the wider your audience, the more likely this is bound to happen. Sorry it had to happen to you as well. Just keep your head up and keep doing great work. Keep moving forward! I agree with you 100% Rob. I think you’ve said really important things here. my son is another that is unlikely to ever speak for himself. however the major reason why he is unlikely to stand up for himself is because he is uninterested. He has his thing (electronics) and his little world, and realistically he would function perfectly fine if he never had to leave it. He has no interest in leaving that world that is for certain. 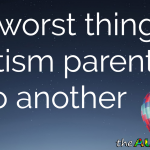 Why do parent’s of autistic children need to be part of the equation? Because not all autistic children will grow up to be able to be productive members of society and the voices of those who will not, will never be heard if the parents of those children do not speak up. CarlBainbridge I totally agree. Well said. Gosh, I didn’t realize there was so much division…I guess I assumed it about the don’t vaccinate/vaccinate debate, but not the rest! 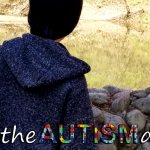 My son has autism as a symptom of his molecular genetic syndrome. He also deals with mental retardation, growth retardation, bone deformities, the list goes on and on. I guess my point is that he is NEVER going to be able to speak for himself. If someone turned me away from trying to raise awareness, I would laugh in their face. That is just ridiculous! Of course we should all band together to fight for the rights of all families dealing with autism, regardless of who is actually diagnosed. I bet it is more of an ego issue.